Robert M. Kershner, M.D., F.A.C.S., P.C. We are located on the third floor of the Orange Grove Medical Building on Orange Grove Road, east of La Cholla Boulevard, on the campus of Northwest Medical Center in Tucson. Take Interstate 10 South to Tucson, Arizona. Exit East (left) at the Orange Grove Road Exit. Travel east approximately 2 miles. The office is located on the south (right) side of the street, just after crossing the LaCholla Road intersection. Take Interstate 10 North to Tucson, Arizona. Exit East (right) at the Orange Grove Road Exit. Travel east approximately 2 miles. The office is located on the south (right) side of the street just after crossing the LaCholla Road intersection. Travel West on Skyline Road to Sunrise Road. Turn left onto Orange Grove Road. Travel approximately 2 miles passing through the Oracle Road intersection. The office is on the south (left) side of the street just before the LaCholla intersection. Travel East on Grant Road to Interstate 10 North and exit Orange Grove Road traveling East. 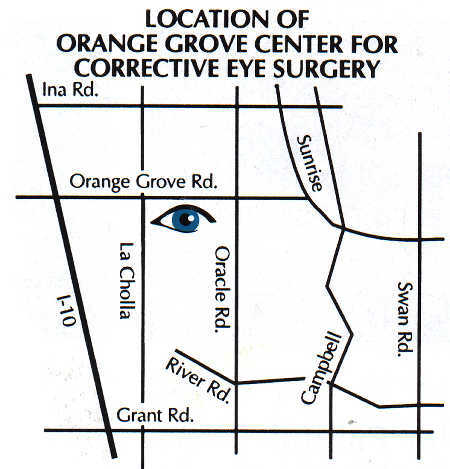 Otherwise travel north on Oracle Road until the intersection of Orange Grove Road and turn left (west). The office is on the south (left) side of the street just before the LaCholla intersection. Need Help Getting to Tucson?-Contact US Now.